There’s a saying that death comes to us all, and for some of us it means the end of life altogether, while for others it means the beginning of a new journey into an afterlife that may or may not prove to be better than the life we’ve lived. 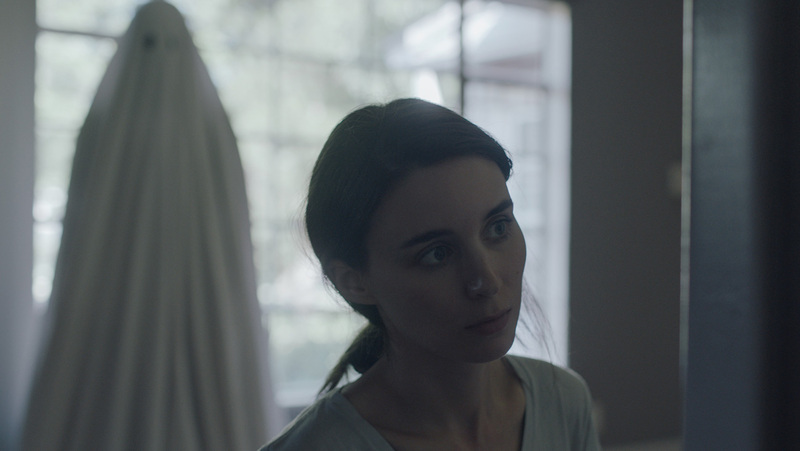 David Lowery’s latest movie takes that idea, but then adds a twist to it, and asks the question, what if there is an afterlife, but we were delayed in taking that journey onward? What if we found ourselves trapped between our old life and the next one? What would that be like? How would it feel? And how would someone cope in such a situation? Could someone cope in that situation? These are all intriguing ideas, and Lowery does his best to answer all of those questions, including what could sustain us through such an experience, and how much would it change us? The ghost of the title is at first just a man, a musician called C (Affleck) who is married to M (Mara). They live in a small tract house, and seem to get along okay, but there are shifts and challenges in their relationship that show themselves from time to time. But their time together is coming to an end. C is killed in a car crash outside their home. M is asked to identify his body at a hospital mortuary. He lies on a table covered by a large white sheet, and after she has seen him and left, he sits up. He walks slowly through the hospital, unseen by staff, patients and visitors, until he comes to a wall. The wall opens to reveal a portal full of swirling light. The invitation is clear, but C doesn’t take it. Instead he makes his way back to his home, where a grieving M has no idea of his presence. He watches her as she begins to rebuild her life, and then one day he sees her write something down on a slip of paper, and then put the slip of paper in a small gap in the wall. She paints over the gap, sealing it. C decides to retrieve the slip of paper but the sheet makes it awkward to remove the paint. As he picks away at the paint, time appears to race on and he finds an Hispanic single mother (Acevedo) and her two children have moved into the house. Having established a secondary reason for C’s remaining at the property, Lowery soon shows how this affects C and increases the sense of separation that he’s experiencing. As with everyone else, this new family go about their days oblivious to his presence, just as M did, but now it’s more pronounced. This family is living in his home, and M isn’t among them; she isn’t coming back and now he’s stranded there, amongst strangers. He learns how to move things, how to have a corporeal effect despite being a non-corporeal form. Eventually they leave, frightened by the violent behaviour he’s able to display. But it proves to be a transient victory. Soon he’s surrounded by people, as the next owners of the house throw a party. And then time passes more quickly, folding over and into itself, forging ahead in great leaps, and leaving the house behind as a distant memory, much as C has become a distant memory in the minds of those who knew him. It’s at this point in the movie that Lowery effectively makes C’s existence the stuff of existential horror. As if things haven’t been bad enough, events transpire that keep C even more isolated and becalmed by his death. He’s forced to bear witness to changes and developments that he couldn’t have foreseen and Time becomes an implacable foe, thoughtless and cruel. He becomes even more stranded despite his never moving from the site of his home, and soon he’s nothing more than a shell, just existing in a vague approximation of Life. Lowery and Affleck find the sadness and the intense loneliness in this, and C becomes an even more tragic figure, the black eye holes of the sheet expressing longing, regret, anguish, melancholy, and the overwhelming grief that C is feeling. Affleck uses slow, measured movements to show just how C’s emotions are ebbing and flowing, and despite the sheet (or maybe because of it), there’s not one moment in the movie where C’s sensitivity to his situation isn’t easy to grasp. It’s a performance that is so detailed and so subtle that it makes the movie much more emotional and affecting than it looks. 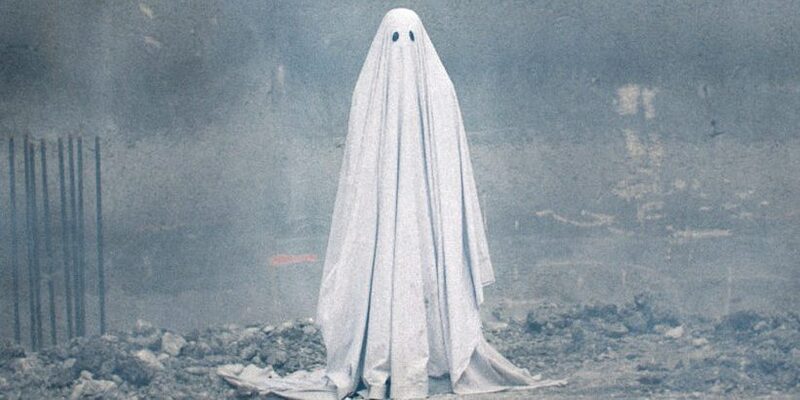 Of course, what’s really clever and exceptional about A Ghost Story, is that Lowery has taken such an iconic image – perhaps the most simple ghost “costume” – and used it as a metaphor for the pain that grief can cause us, and its potentially unyielding nature. The enormity of C’s situation is horrifying, to remain trapped in a place that offers less and less reason to be there, and which only serves to highlight and increase the amount of pain C is experiencing as each and every day passes by. How crushing must that be? That Lowery is able to get this message across so effectively – and so chillingly – is a tribute to the clarity of his artistic vision, and the work of Affleck and Mara, and a very talented crew. Working with cinematographer Andrew Droz Palermo, and production designers Jade Healy and Tom Walker, Lowery has put together a movie whose distinct visual look includes a high number of static shots where the camera remains resolutely fixed in position, to careful framing of C as he watches and waits in the same location even as it changes all around him. This is as much about the space that he exists in, as it is his own existence within it. What all this gives us is a movie that is by turns poetic, sad, poignant, humorous (yes), engrossing, and endlessly thought-provoking. It seeks to address and confront aspects of our existence that we don’t give regular consideration to, such as what it is to be truly alone, and our very reason for being, both physically and spiritually. But it’s not a “heavy” movie, and nor is it one to avoid because of the challenging ideas it explores. Rather it’s a movie that celebrates life and many of the complexities that make it worth living, and which we might continue to explore after death (if an afterlife is what awaits us). C has the opportunity to “move on” but he chooses to remain, to be with his wife and in his home, because – and as corny as it sounds – he loves them both and doesn’t want to lose them. What better reason could there be for spending an eternity covered in a sheet? 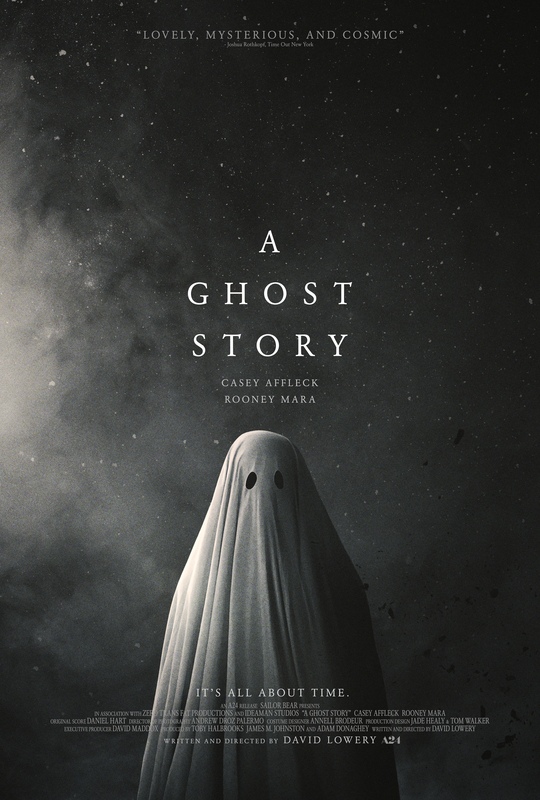 Rating: 9/10 – not for all tastes, but nevertheless one of the most audacious and moving movies of recent years, A Ghost Story is a powerful meditation on the forces of grief and love, and what they can make us do – and endure; a superb, necessarily understated performance by Affleck provides much of the movie’s emotional depth, but this is also intelligent and shrewd in its approach to what could have been a much weightier, and less focused story.